Asbestos is a heat-resistant mineral fiber used in fire-resistant and insulating materials. Years ago, it was used for everything from fireproof vests to home and commercial construction. It was woven into fabric and mixed with cement. Now we know asbestos is toxic and is a known cause of mesothelioma cancer. Asbestos is banned in more than 50 countries, but not in the U.S.
Where Could It Lurk In Your Home? Most products made today don’t contain asbestos. Those few that do are required to be labeled. But until the 1970s, many types of building products and insulation materials used in homes contained asbestos. Some roofing and siding shingles are made of asbestos cement. Houses built between 1930 and 1950 may have asbestos as insulation. Asbestos can be in textured paint and in patching compounds used on wall and ceiling joints. Their use was banned in 1977. Experts say the best thing to do if you discover asbestos that’s in good condition is to leave it alone. Generally, material in good condition won’t release asbestos fibers. There’s no danger unless fibers are released and inhaled into the lungs. But if you disturb it, you may create a health hazard where there wasn’t one before. Damaged asbestos doesn’t always have to be removed. Sometimes it can be repaired, which usually involves either sealing or covering the asbestos material. Removal is usually the most expensive method and, unless required by state or local regulations, should be your the last option. Removal poses the greatest risk of fiber release. But removal may be necessary when remodeling or making major changes to your home that will disturb the asbestos. Also, removal may be called for if asbestos material is damaged extensively and can’t be otherwise repaired. Experts recommend you hire a contractor with special asbestos removal training, due to the health risks involved. Ask asbestos professionals to document their completion of federal or state-approved training. Each person performing work in your home should provide proof of training and licensing in asbestos work, such as completion of EPA-approved training. State and local health departments or EPA regional offices may have listings of licensed professionals in your area. Asbestos is considered hazardous material. So you can’t just toss it into a dumpster along with old ceiling tiles, hunks of drywall and your crummy bathroom sink. Each municipality has its own rules for asbestos disposal. 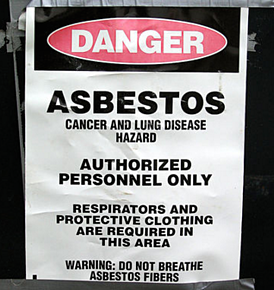 Asbestos can only be disposed of at certain regulated locations. That means the rules also differ from one Bin There Dump That operator to another. In Kansas City, for example, Bin There Dump That operators aren’t allowed to accept asbestos. In Atlanta, special paperwork has to be filed in order to dispose of asbestos. 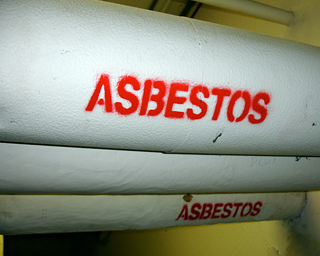 We highly recommend you leave asbestos removal to the professionals. If you have questions about the rules in your area, contact a Bin There Dump That operator near you.